The Dorking is one of the oldest breeds of chicken known to us in the west. Their ancestors are believed to have been introduced into Britain by Roman troops; and indeed the Roman writer Columella, in his treatise on agriculture, written in the 1st century AD, describes a 5-toed chicken of a type very similar to the modern Dorking. The Dorking gets its name from the town of Dorking in Surrey, England, long famous for its poultry market. In the 19th century Dorking fowl were prized for the quality of their breast meat, and they are said to have been a favourite at Queen Victoria's dinner table! Early hybridization efforts involved crossing Dorking roosters with Cornish or Indian game hens to produce a meat bird that matured early and at a larger size than either of its parents. 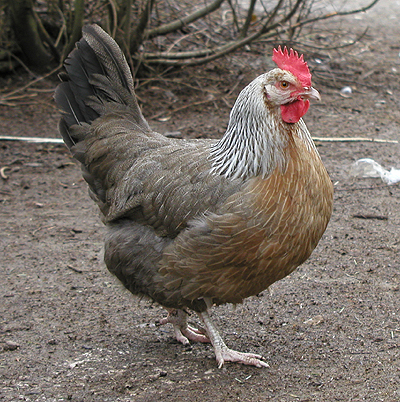 Dorkings were also used to develop several other breeds, such as the Sussex, and were among the earliest chickens to be introduced to North America. Prior to the American Civil War they were one of the most common barnyard fowl there. The large-breasted, rectangular shape on relatively short legs and the 5th toe are characteristic for the Dorking. They are a dual purpose fowl, kept for both meat and eggs. The roosters can weigh up to 4.5 kg, the hens up to 3.5 kg. They are good, active foragers, and fly surprisingly well despite their size - many of ours routinely roost in the trees. We breed the lovely Silver Grey Dorkings, but there are also red, white, cuckoo, coloured and several other varieties, many now extinct, or very nearly so.